Having spent many years working in a Japanese corporation, I am used to seeing odd juxtapositions of western images with Asian messages, but this one took me by surprise. Over at Faith and Family Live, Rebecca Teti has linked to a site featuring vintage Tokyo subway posters. Two of these posters feature Christian religious symbolism. 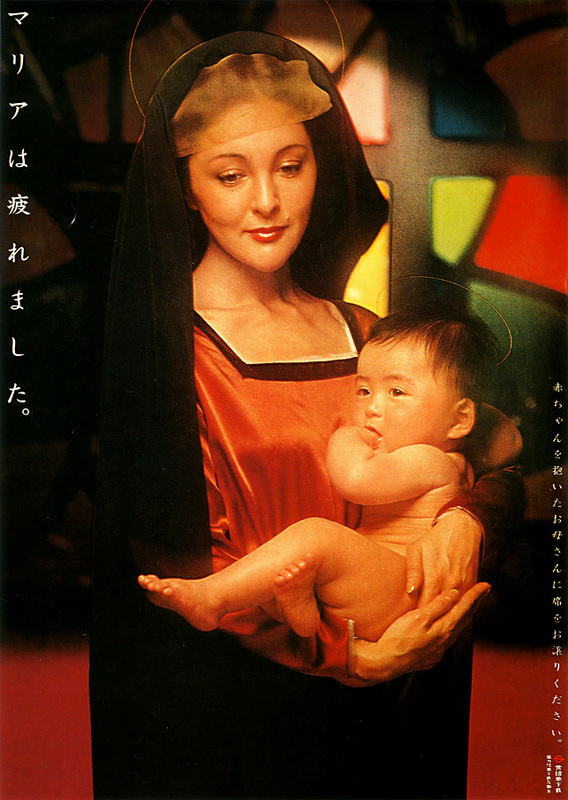 The first is this poster of the Madonna and Child entitled "Mary is Tired." The point is to encourage people to give up their seats to women with young children. The other poster features Jesus at the Last Supper being overwhelmed by umbrellas. The message is a play on Japanese words that fit the religious imagery and also invoke the concept of having too many of something. 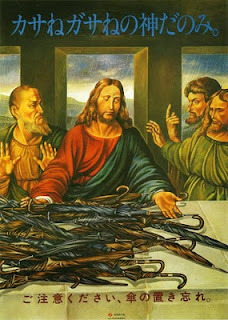 The point of this poster is to remind people not to forget their umbrellas.